Mary W. Williams (1822-1903) was one of eight children of Etheldred Williams and Mary Copeland. Her father was a wealthy merchant in Bean Station, Grainger Co., who also owned property in the city of Knoxville. 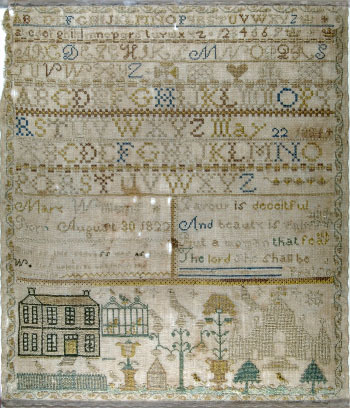 Mary’s name appears in the Knoxville Female Academy records in 1829 and 1831, so it is likely that she made her sampler there. Mary wed John Hervey Crozier, a trustee of the Knoxville Female Academy, in 1841. Her husband was an attorney who served in the United States House of Representatives from 1845 to 1849. The couple had nine children, one of whom was Lizzie Crozier French, founder of the Woman’s Education and Industrial Union for working women. Knoxville Female Academy was directed by Rev. Joseph Estabrook and his wife Nancy Dickinson Estabrook from 1828 to 1843. Originally from New Hampshire and Massachusetts respectively, they had operated a female academy in Staunton, VA, just before coming to Knoxville. 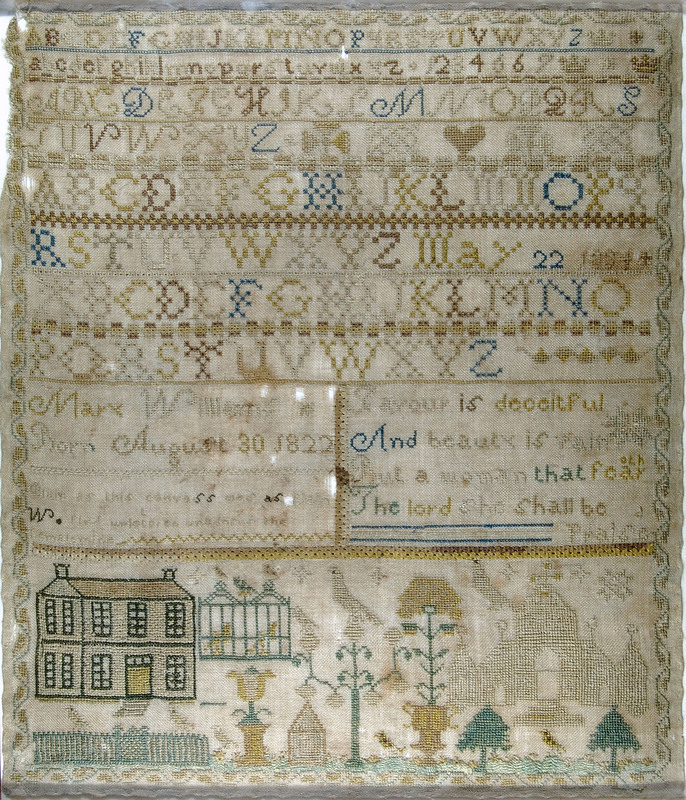 Mary’s sampler is similar to samplers made in Lynchburg, VA. Lynchburg is just 75 miles from Staunton, so it is possible that Mrs. Estabrook brought the pattern to Tennessee.